Now we examine issues of Cuban human rights that probably will be put on the agenda for further discussions by looking at the recent speech on this subject by Cuban Foreign Minister Bruno Rodriguez Parrilla. Subsequent posts will look at the U.N. Human Rights Council’s most recent Universal Periodic Review (UPR) of Cuba and at the latest U.S. State Department report on Cuban human rights (the one issued in 2014 for 2013). Observations about these sources will be made in a later post while other subsequent posts will engage in a similar analysis about issues of U.S. human rights that are likely to be covered in the bilateral talks. As discussed in a prior post, the U.N. Human Rights Council opened what it called its “High -Level Segment” on March 2, 2015, at its headquarters in Geneva Switzerland. One of the speakers that day was the Cuban Foreign Minister, whose speech will be excerpted below. Cuba, he asserted, maintains “a high level of cooperation and interaction with the procedures and mechanisms of the [U.N.] when it comes to universal human rights and a positive dialogue with the organs created by virtue of international treaties. It is in that spirit that we are conveying an invitation to the President of the International Committee of the Red Cross and the [U.N.] Rapporteur on Trafficking in Persons” to visit Cuba. The Foreign Minister also raised the subjects of the International Labor Organization’s Convention 87  and Convention 98 , both of which have been ratified by Cuba. This portion of the post is based upon the following: Vigezzi, Statement by Bruno Rodriguez at Human Rights Council in Geneva, Nat’l Network on Cuba (Mar. 2, 2015); U.N. Hum. Rts. Council, Human Rights Council hears from 11 dignitaries as it continues its High-Level Segment, (Mar. 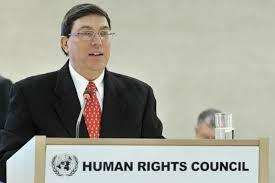 2, 2015); Cuban Foreign Minister speaks at the Human Rights Council, Granma (Mar. 4, 2015). The Cuban Foreign Minister’s speech also criticized certain aspects of the human rights records of the U.S. and other unnamed industrialized countries; these comments will be examined in a later post about issues of U.S. human rights that might be added to the agenda for discussions between the two countries. ILO Convention No. 87 (Convention on Freedom of Association and Protection of the Right to Organise [sic], 1948) has been ratified by 153 states, including Cuba and all 28 EU members. The U.S. has not so ratified and thus is not a party to this treaty although there are many federal and state laws on the subject. ILO Convention No. 98 (Right to Organize and Collective Bargaining Convention, 1949) has been ratified by 164 states, including Cuba and all 28 EU members. The U.S. has not so ratified and thus is not a party to this treaty although there are many federal and state laws on the subject.